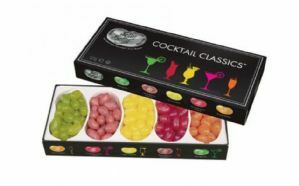 Jelly Belly Jelly Bean Cocktail Classics Gift Box 125g. Gourmet Jelly Belly Jelly Beans! An assortment of 5 cocktail classic flavours. Jelly Belly beans presented in a gift box. This ideal present contains 5 flavours in 5 seperate compartments. 125g. For the Jelly Belly aficionado - no other gourmet beans will do.